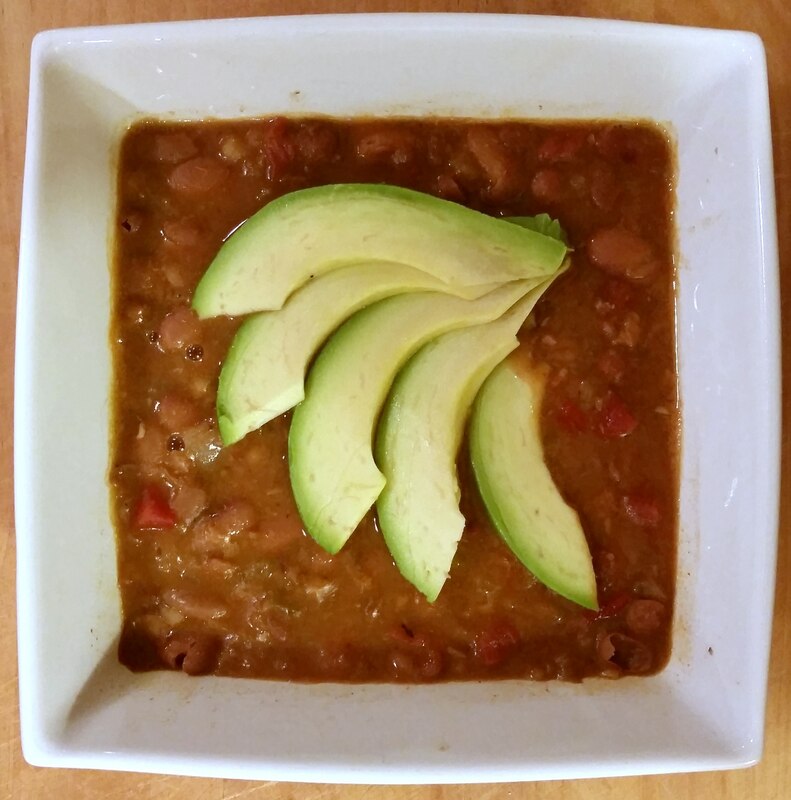 I made some quick chili based on a recipe in the Moosewood Cookbook, but with some tweaks for the ingredients I had on hand. I also used a pressure cooker instead of slow simmering on the stovetop—quicker cooking means less heat in the kitchen. After the beans and wheat are done soaking, it takes about half an hour for the chili to cook. Never used a pressure cooker? WikiHow has some great instructions. And if you want to learn how to make no-sodium vegetable broth, one of the optional ingredients, here’s the recipe. Put beans and wheat in a large pot or bowl. Cover with 2–3 inches of water. Let soak overnight or about 6–8 hours. (Alternative: Place in pot on stovetop and bring to boiling. Remove from heat and let sit one hour.) When done soaking, pour into a sieve and rinse. Get out the pressure cooker. With the lid off, heat oil on medium or medium-low. Sauté onions and garlic until onions are clear (about 3–5 minutes). Add herbs and spices and sauté for a couple minutes. Add water or broth, tomato juice, salt or bouillon, beans, and wheat. Place lid on pressure cooker and lock. Set to highest pressure and cook on high heat. When pressure cooker reaches pressure (see your cooker instructions for how to tell), turn heat to low and cook for 9 minutes. After 9 minutes, turn off heat. Do not open valve or remove weighted gauge. Wait for pressure to return to normal (about 10–20 minutes). Remove lid and add tomatoes and salsa. Turn heat back on and simmer for 10-20 minutes, until slightly thickened. Serve with sliced avocados and/or crumbled tortilla chips. 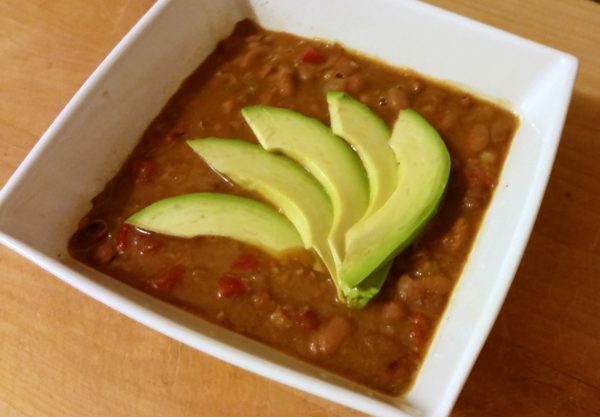 Great recipe Kathryn - vegan chilli is so good. Try adding a little cocoa powder too - it makes the sauce even richer without coming through in the end flavour ? That's brilliant! I love mole, so I'm sure I'd like that. Do you use regular cocoa powder or Dutch (alkalized)?